As of September 2009 we are now no longer stocking the Lavod Aquacube Blue for Swim Goggles due to a high return rate from our customers due to product failure. We advise all potential customers not buy this product until Lavod can guarantee its reliabilty. Unlike waterproof mp3 players worn with an armband or swimbelt the AquaCube 296v attaches to the strap of your swimming goggles. The Aquatube 296v is a wireless solution using a special designed clip holder that fixes on to your swimming goggles. 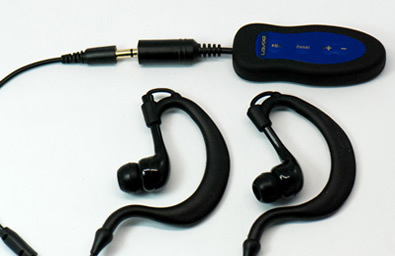 3 meters depth for 3 hours in water, meets IPx8 standard for both waterproof MP3 player and the waterproof headphones. Clip holder fixes on to your goggles. Earbuds for various ear sizes. Specially made ear hanging waterproof headphones gives a comfortable and secure fit for swimming. Player weighs less than 16 grams and has a length of 6 cm (the body). Lavod LFA-296v AquaCube Waterproof MP3 Player.